Our company has been called the number one party bus service company in the area. And for very good reason. We provide our great luxury transportation services all over Detroit and in the greater area with the kind of class and flair that no other company can provide. 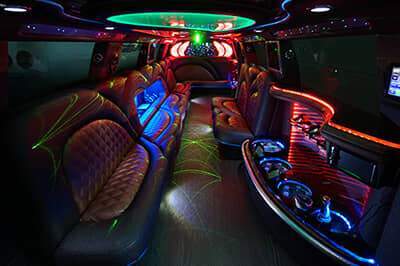 If you are not familiar with a party bus then let us explain - think of a limousine, but without the cramped space. 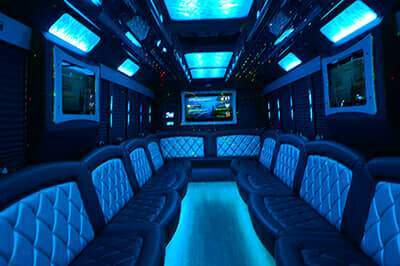 Our party buses have the luxurious feel of a limousine with hardwood floors and custom wrap-around leather seats, but and with many more entertainment features like large flat screen televisions, dance poles, colorful accent lighting, and built-in bars. To put it another way, it is as though you combined a limousine and a nightclub and put them inside a bus. And what a great thing to be able to stand up walk around freely while the bus is moving down the road. 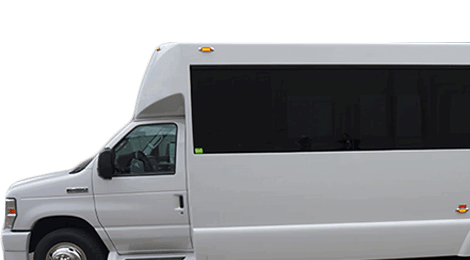 There is no better transportation for your bachelor and bachelorette parties, weddings and receptions, or birthdays and sporting events. In fact, we have never seen or heard about an event that one of our amazing vehicles could not make even better. Let's face it, when most people are planning an event, one of the last things that they think about is how they are going to get around. Most people just resolve themselves to the idea of having to carpool. And when you really consider what that means, carpooling is one of the worst transportation solutions you could possibly use. Think about it, your entire group will be split into segments for the entire time and each car will have to fight traffic, search maybe even pay for parking places reasonably close to each other and then meet up again at each destination. Another factor that can dampen the fun is the fact that you will have to choose a designated driver for each vehicle which means that the chosen drivers will not be able to participate in having some tasty libations. And if you choose to ignore that, you run the risk of a DUI or even worse. This doesn't sound like fun like a night on the town should be. For that reason, why not leave the driving to our professional chauffeured transportation service. 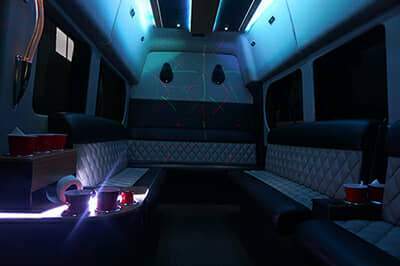 Allow you and your friends, and family to have a blast as they spend the whole night together enjoying the exciting amenities we have installed on our amazing vehicles which will exceed your highest expectation for every outing from ground transportation to concerts, a sporting event, a Quinceanera, wine tours, even to your special occasion outings like your wedding, bachelor parties, bachelorette parties and your anniversaries. We provide professionalism on all occasions, even if you are just going on out on the town when you book our late model Mercedes Sprinter to take you away, your ride will be unforgettable with our courteous chauffeur in manning the wheel in your luxury vehicle. We are very proud of the fact that our vehicles are the best of the best. We continually make sure of this as we not only buy quality, we also have certified mechanics on staff who are regularly inspecting and maintaining our entire fleet to make sure they are road worthy. And we haven't forgotten about the interiors either. Our professional detailers will comb every inch of each vehicle that has been used and when they are finished, it will look like brand new. And when it comes to customer service, our customer service representatives have been trained to treat all of our customers or potential customer like family. When you contact us, you will find a patient and sympathetic ear on the other end of the line. After answering your questions, you will be asked a few simple questions about your plans. Based on your answers, you will be fitted to the perfect vehicle and given a quote. At that point, you will have a choice of moving forward with booking the vehicle or thinking about it some more. Either way, we promise that you will never be pressured into making any kind of decision. Our office staff are waiting and willing to help 24/7, 365 days a year. We hope to hear from you soon to talk about your plans. The Metro Detroit areas that we service the most are Downtown Detroit, Dearborn, Birmingham, Royal Oak, Mount Clemens, Ann Arbor, Novi, Pontiac, and all over Downriver, but our service area is much more extensive than just that, and chances are good that we service the area you're traveling to. You can check out our service area page for a more extensive list, or just call us to find out more about your reservation or just to get a quote one on of our late model vehicles! If you don't see your location listed on our service area page, don't worry, our extended service area is huge so just give us a call! Our professional chauffeurs are the best equipped group transportation specialists to take care of your travel needs in the Metro Detroit area. Other companies hire drivers, we hire professionally trained chauffeurs. In addition to their professional training, they have to pass our transportation industry leading qualifications, including driving tests, background checks, and even driving record checks. We leave no stone unturned when it comes to your protection. And of course we also make every limo driver we hire take our vehicles on the road with only their trainer to get the best real life testing completed, only once we know they are dependable in even our largest limousine bus will we then permit them to provide you stretch limousine service to and from your next event. You're in great hands with Detroit Limo Bus! We promise you can trust us to provide transportation whether it's for your birthday, wedding, or your child's prom limo! If you're not quite ready to book yet, you can sign up for our free mailing list to be contacted about news and promotions! Just CLICK HERE to sign up! If you're in need of service in other areas feel free to try Pink Party Bus Service, Windsor Party Bus, Las Vegas Party Bus, or Pink Cruiser. For entertainment or just a night out in different areas point your browser to NYC Cigar Bars and Chicago Carpet Cleaning. Gorgeous 32" Flat screen TVs, larger in some buses! Incredible premium adjustable LED mood lighting that cycles through colors. Set just the right mood for your event! Professional grade 1400 watt surround sound system, with three 10 inch JL Audio subwoofers powering both the stereo and the video setup! The best moment of your life! This one day will be remembered by all who are involved. Another year older, another reason to party. Have the time of your life and loads of fun! Take time to relax and have some fun. Go out with friends and go bar hopping and drink. Copyright © 2017 | Metro Detroit Party Bus | All Rights Reserved.